In people that work a lot with their hands above their head (painters, plasterers, etc.) or in certain sports (swimming, sports that involve throwing, volleyball etc.) 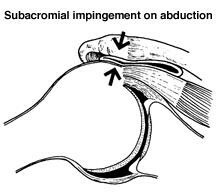 friction of the tendons of the rotator cuff under the acromion may lead to permanent pain, the impingement syndrome or pinching of the shoulder tendon. This may also occur with relatively normal use of the shoulder, among people that have too little space between the acromion and the ball of the shoulder. It could be congenital, or develop gradually as a result of wear and tear and osteoarthritis with bone outgrowth on the underside of the acromion. It results in a thickening and irritation of the bursa, which becomes inflamed. 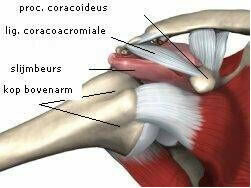 The shoulder tendon or rotator cuff swells up and becomes inflamed and may be damaged or even tear over time. A case of a trapped and inflamed tendon is suspected based on your account and following a clinical examination. Further investigation using ultrasound and/or imaging will confirm it. Initially painkillers and anti-inflammatory medication (NSAIDs) may produce a temporary improvement. Injections with corticosteroids may also help, but if misused can have a more detrimental effect on the quality of the tendon. If conservative treatment fails surgery may be considered. In this case it concerns an ‘acromioplasty’, a procedure in which some bone is removed from under the acromion to relieve the pinching of the rotator cuff. Nowadays, in most cases shoulder problems can be treated using an operation that is far less invasive than in the past. This operation is called arthroscopy or keyhole surgery. The advantage of arthroscopy is that the orthopaedic surgeon can see more of the shoulder joint via a few small incisions, than in a so-called ‘open operation’, which necessitates a much larger incision. The small wounds also heal quicker and leave minimal scars. The operation is less painful than an open procedure and the first few post-operative weeks are much more bearable for the patient. Moreover, the risk of certain complications is also reduced. The arthroscopic acromioplasty is an operation that is performed under a general anaesthetic combined with a local anaesthetic. You are operated upon in a seated position. The inside of the shoulder joint is viewed using a camera inserted through small incisions (0.75 cm). The surgeon examines whether there is any damage to the muscles around the shoulder joint and the joint capsule. The orthopaedic surgeon is able to insert different kinds of instruments such as small scissors and examining hooks through the stitch-size incisions. The shoulder is rinsed with water, which expands it, providing the orthopaedic surgeon with a clearer picture and making it easier for him or her to operate. Following a thorough inspection of the shoulder joint, the inflamed bursa is removed. 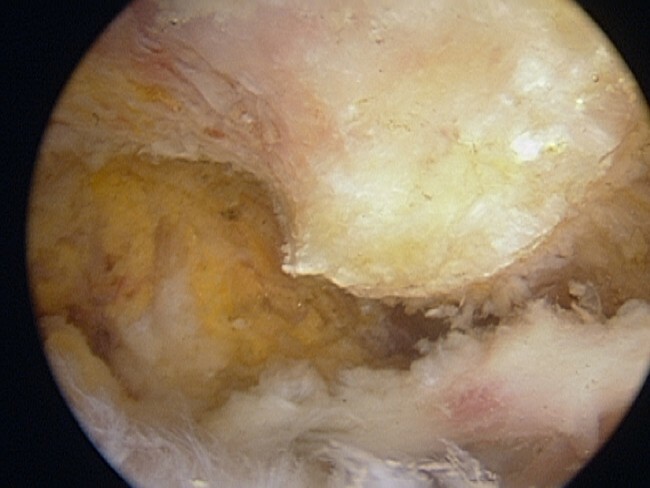 Any calcification present in the tendon is removed as much as possible. Any inflammation around the tendon is eliminated and any irregularities are smoothed out. At the end of the procedure we shave the underside of the acromion to create more space for the muscles and tendons. This is achieved using a cutter that shaves off the excess bone. This increases the space between the ball of the shoulder and the acromion so that the tendon and muscle in between are not as compressed. At the end of the operation the small incisions are stitched up or left open to reduce the swelling. You will receive a sling in which you can rest your arm.